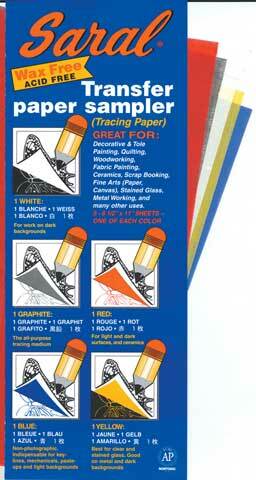 Assortments with five 8-1/2" x 11" sheets of wax-free transfer paper. The Sampler contains one sheet each of blue, graphite, red, white and yellow. The Tole & Craft Kit contains one sheet each of graphite and yellow and three sheets of white.